Small businesses have a few advantages when it comes to managing customer relations. According to Nasdaq, customer service is one area in which small businesses can outperform the larger corporations. However, managing customer relationships and tracking data may not seem so easy when you have employees to manage, finances to deal with and products to order, ship and track. Large businesses have exclusive departments to handle customer affairs, taking the load off the upper management. Small business owners can use CRM as a way to manage everything in one place while minimizing any frustration and stress. For the newcomers to CRM, this acronym stands for customer relationship management. Businesses both small and large benefit from using CRM to help them manage, analyze and improve their relationships with customers. With CRM software, business owners can also handle basic contact and task management, generate email alerts, set up assignment rules and perform other business tasks more efficiently. A CRM should provide easy usability and power in one, giving you and your employees the ability to perform everyday tasks without fail. It should have a straight-forward interface with quick loading times and various features such as integration with your email client and accounting software. This review pits Insightly versus Zoho and Salesforce, three popular CRM services that cater to small businesses with up to 20 employees. Insightly caters to small businesses, providing easy-to-use features for handling day-to-day tasks and managing long-term goals. With Insightly, you can manage your customers, vendors and business partners and organize everything all in one place. According to the creators, more than 800,000 people across 100 countries use Insightly, and more businesses sign up each day. Insightly Free costs nothing to use and includes 10 advanced reports, five email templates, 10 mass emails per day, 2,500 records, 250 megabytes of storage and a file import limit of 500 rows. Insightly Basic costs $12 per user each month but comes with unlimited advanced reports, a mobile app and a business card scanner to create five cards per month. You can generate up to five scheduled reports and smart alerts, 50 email templates and 25,000 records. It also includes one gigabyte of storage space, 50 custom fields, 500 mass emails per day and email support. Insightly Plus raises the cost to $29 per month for each user but increases the limit of records, reports, email templates and storage space. You also gain access to priority email support and can send up 2,500 mass emails per day. Insightly Professional costs $49 per month for each user and raises your online storage to 100 gigabytes. You also get unlimited email templates and advanced reports. You can send 5,000 mass emails per day and import 50,000 file rows. Insightly Enterprise costs $99 per user each month and offers the most bang for the buck. You get 250 scheduled reports and smart alerts per day, including 1,000 custom fields, 250 gigabytes of storage, 10,000 mass emails and unlimited email templates. These prices can change at any time and are based on annual billing. Insightly raises the price for those who want to be billed each month. You can find out more information on Insightly’s pricing guide to see which plan works best for you and your business. When it comes to affordable CRM for small businesses, Insightly impresses with its free and low-cost options. You don’t have to pay a dime to have online storage, keep track of records or send mass emails. If you want more features, you can upgrade your plan at an affordable price. It has an easy-to-use interface, loads quickly and makes it simple to categorize and keep track of tasks. Those who opt for the free plan might feel a bit disappointed. With no mobile app, it’s hard to manage your contacts on the go. You don’t have access to a business card scanner and have to rely on the Insightly Community Q&A for help. The additional charge for billing per month seems unnecessary, and the limited online storage can fill up quickly. Insightly offers great features for small business owners who want to get a handle on their everyday operations. It has various plans to fit any budget and comes with just enough features in the free and basic versions to get you started. You have the option to upgrade your account and increase your limits at any time, and the online community is always ready to help if you have a problem. Zoho wants you to treat your routine tasks like a game. By turning tasks into a contest, you get your sales personnel to compete and work their way up the leaderboard. Your employees can earn badges and trophies while increasing productivity and sales for the entire company. With Zoho, you have a better way to interact with your employees while managing customer relations. Zoho includes other features like visitor tracking and email analytics, helping you to find new ways and opportunities to engage, connect and communicate with your customers. It also adds useful additions like integration with Twitter, Facebook and Google Plus, including sales forecasting and calendar sync. Zoho follows in the footsteps of Insightly and offers a free version for those who don’t need pay-to-use features. You can also try the Standard, Professional, Enterprise and CRM Plus plans free for 15 days. Zoho Free costs nothing to use for up to 10 people in your business and comes with sales force automation tools for leads, contacts and accounts. It has social media integration tools and provides 10 email templates and a gigabyte of online storage. Zoho Standard costs $12 per month for each user and includes features such as sales forecasting, roles and profiles, mass email and call center connectors. You get the basic features from the free version as well as 100,000 records, a document library and dashboards. Zoho Professional costs $20 per user each month and includes all the features from the standard plan plus email and Google AdWords integration, workflow automation, inventory management and unlimited records. Zoho Enterprise raises the cost to $35 per month for each user in your business and includes every feature from the professional version. You also get territory management, custom applications, page layouts, multiple currencies and more. Zoho CRM Plus costs $50 per user each month and includes everything from the previous versions. You also have access to priority support, enhanced storage, a sandbox and a dedicated database cluster. Zoho bills your account annually. However, if you prefer to pay monthly, you’ll have to pay an additional $5 per month for your plan. It’s important to check out the pricing guide and compare the features for yourself before signing up for an account. Zoho comes with sales-tracking tools to make generating and following up on leads as easy as possible. It also comes with tools for managing customer service cases and tracking website visitors, making your life much easier when organizing leads and contacts. You can automate most anything in the program and get your sales force actively involved and excited with Zoho Gamescope. Whereas Insightly includes generous online storage space with each upgrade, Zoho only provides a gigabyte with each plan. If you want more storage, you have to pay $4 extra per month for five gigabytes. You can only back up your data twice per month; you have to pay $10 per request after that. Though it comes with many features, you can often get lost in the interface while trying to find something. Zoho offers a lot of features at a reasonable price. You can use the service for free or upgrade to a paid edition for more features and support. Although it has a lot of sales-centric tools, it’s a viable CRM for small businesses that need to keep track of their contacts and customers all in one place. Salesforce takes CRM to another level, getting the data out of the way so that you can focus more on your customers. It’s a highly reputable CRM and has appeared in Fortune 500 and Forbes. On the feature side, it comes with Relationship Intelligence technology, which assists you in closing deals more quickly. You can capture and sync your data on the computer and mobile devices and collaborate with your team members for greater sales efficiency. With these combined applications, you can sign documents, create invoices and send “thank you” notes directly within Salesforce. Therefore, you get an all-in-one system for generating and closing sales, managing customer relations and working with your team without the need for additional programs or services. Salesforce doesn’t offer a free version to use, so you’ll have to pay money regardless of whether you select the Starter, Growth, Business or Lighting Unlimited plans. Salesforce Starter costs $25 per month for up to five users. It comes with one list and easy setup. You get automatic data capture, follow-up reminders, a shared address book and more. Salesforce Growth comes in at $75 per month for each user on your team. It includes all the Starter features but gives you access to unlimited lists. You also get sales and activity reports, three direct integrations and CRM data in your inbox. Salesforce Business costs $125 per month for each user and includes the Growth features plus advanced pipeline reporting, unlimited direct integrations, forecasting and API access. Salesforce Lightning Unlimited offers the most features of any plan but costs $300 per month. With this plan, you get unlimited customization, custom apps and online training. You also benefit from 24/7 toll-free support and additional data storage. You can use Salesforce freely for 14 days and see if it works best for your needs. Afterward, you should compare the prices and features and determine whether those features are worth the extra cost per month. Salesforce combines sales and CRM tools in one and makes your life easier with third-party integration. The automation tools get the data out of the way and let you hone in on your customers. You can work on the go using the mobile app and capture or close leads wherever you are. You only get a 14-day free trial to test the service. There’s no free version like you get with Insightly or Zoho, and the price increases substantially with each upgrade. In addition, the interface is more difficult to use and doesn’t feel as responsive as the other two CRM services. Salesforce is a powerful CRM with numerous features to help you capture data, personalize your sales tracking and work on the go. It’s hard to beat the third-party integration, and the recommended Growth plan gives you the necessary tools to get a handle on your contacts, customers and data. 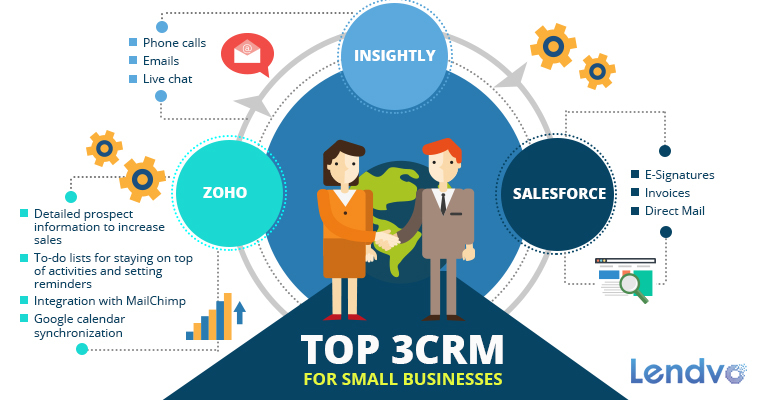 You can’t go wrong with any CRM in this list. Each service is packed with features to help you improve, manage and organize your leads and contacts. Insightly wins overall for its free option, ease of use, low-cost upgrades and performance. However, any small business would benefit from using Zoho or Salesforce. By using a CRM, you don’t have to depend on or keep track of multiple spreadsheets. As a result, you can reduce your frustration and put your focus on your customers and productivity.